In 1939, Andrew Huxley, a recent Cambridge graduate, joined Alan Hodgkin at the Laboratory of the Marine Biological Association in Plymouth, England, to study nerve conduction in the giant axon of Atlantic squid, which has the largest known neurons (nerve cells). They successfully inserted a fine electrode into the axon and were the first to record the intracellular electrical activity. Within weeks, in September, Germany invaded Poland, and war was declared. Their research was suspended for about seven years, during which time they separately supported the war effort, working on military-related projects. Hodgkin and Huxley were not the first to study the electrical properties of animal tissues. In 1848, the German physiologist Emil du Bois-Reymond discovered the action potential, and in 1912 Julius Bernstein hypothesized that the action potential resulted from changes in the movement of potassium ions across the membrane of the axon. We now know that potassium and sodium ions are unequally concentrated inside and outside cells, and that this imbalance results in a voltage difference called a membrane potential. The massive movement of potassium and sodium ions into and out of the nerve cell causes a sudden voltage change, called an action potential, and the electrical impulse enables the activity of an organism to be coordinated by the central nervous system. In 1947, when Hodgkin and Huxley resumed their studies, they used a voltage­ clamp technique, which controls voltage across the axonal membrane. In a series of classic publications in 1952, they presented their highly complex mathematical model of the action potential, which predicted the movement of ions, under different conditions, through ion channels—a groundbreaking quantitative approach that superseded simple qualitative descriptions of biological events. In the 1970s and 1980s, their predictions were experimentally verified. Hodgkin and Huxley were co-recipients of the 1963 Nobel Prize for their experimental and mathematical studies of the nerve action potential. They shared this award with John Eccles, an Australian neurophysiologist, who studied transmission of nerve impulses across synapses (gaps between nerves). SEE ALSO: Animal Electricity (1786), Neuron Doctrine (1891), Neurotransmitters (1920), Sliding Filament Theory of Muscle Contraction (1954). 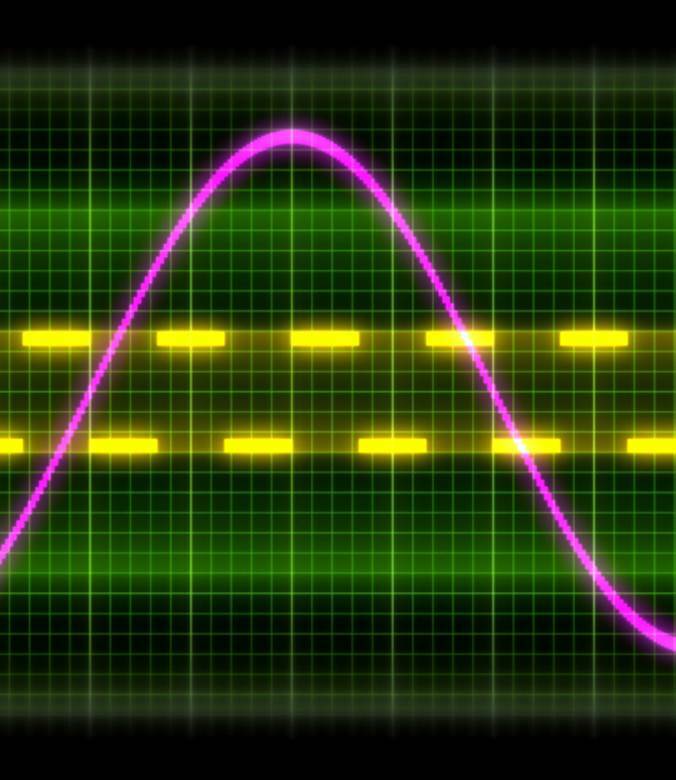 This recording from an oscilloscope or CRO (cathode-ray oscilloscope) permits the researcher to readily observe changes in electrical activity (voltage changes and frequency) in a nerve over time.